GLOBBER EVO COMFORT is the one and only scooter your child will need in the early years. 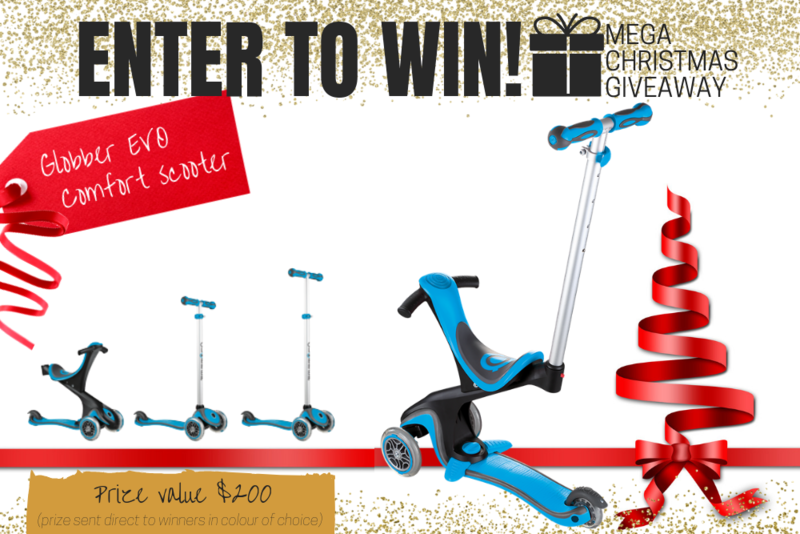 This scooter converts from pushchair, to walking bike to a pre-schooler’s scooter, and eventually an older child’s scooter, saving you retail time and money. Choose from four colours; sky blue, navy, pink and green. Optional light up wheels and other Globber accessories are available from independent retailers and www.globber.com.au. **Please note that prizes must be collected from Peninsula Kids Mornington office and winners will be notified by email. So please only enter if you can collect and make sure details are entered correctly so you don’t miss out! 1. The Competition is open to Australian residents aged 18 years or over. 2. The following are not eligible to enter the Competition: (i) employees and independent contractors of the Promoter and/or its related party entities (i.e. parent companies and subsidiaries); (ii) immediate family members of such employees or independent contractors. In these Terms and Conditions, “immediate family members” includes mother, father, brothers, sisters, sons, daughters or spouse. 1. To enter the Competition, you must subscribe to Peninsula Kids Weekly Newsletter; 2. There is no limit on how many times each person can enter the Competition. The Promoter reserves the right to, at any time, verify an entry or entrant and disqualify an entrant if the Promoter, in its reasonable opinion, believes the entrant has submitted an entry that is not in accordance with these Terms and Conditions. 1. The Competition commences on Friday 23rd November 2018 and closes at midnight on Sunday 9th December 2018 AEST (the “Competition Period”) and only entries received by or on behalf of the Promoter during the Competition Period will be accepted into the Competition. 1. **Globber EVO Comfort - scooter. Total Prize Value $200.00** AUD (the "Prize"). 2. It is the responsibility of the winner to collect the Prize within 7 days of the end of the Competition Period from the Promoter’s Mornington office. 3. The Prize, or any part thereof, must be accepted as awarded and is non-negotiable, non-transferable to another person and non-convertible and is not transferable for cash. 4. The prize must be collected from the Promotors Mornington Office, unless otherwise advised. 1. A prize draw will be conducted within 24 hours of the end of the Competition Period among eligible entrants registered in the application database. 2. The winner will be chosen at random from all eligible entries received during the Competition Period in accordance with these Terms and Conditions. 3. The winner will be notified by Email and noted on the Competition Page on Peninsula Kids website. The winner will be required to accept their Prize by email within 48 hours of notification, otherwise the winner will forfeit any and all claim to the Prize awarded but not accepted. Details of how to collect the Prize will be given at this time. 4. The Promoter reserves the right to cancel this Competition at any stage, if deemed necessary in its reasonable opinion, or if circumstances arise out of its control. 5. In the event that a winner is not contactable (after Mornington Peninsula Kids uses its best endeavours to contact the winner using the contact details provided by the winner), a second chance or unclaimed prize draw will take place. The second chance or unclaimed prize draw will be Emailed/Messaged. 1. By participating in the Competition, you agree (i) to be bound by these Terms and Conditions (which may be amended or varied at any time by us with or without notice) and by our decisions which are final in all matters relating to these Terms and Conditions, the Competition, the draw(s) and/or the results and no correspondence or discussion shall be entered into, and (ii) that Promoter may register you for the Mornington Peninsula Kids e-newsletter. 2. All changes to the Terms and Conditions will be posted on the Peninsula Kids web page. 3. All entries in the Competition become the property of the Promoter and will not be returned. 4. An entry must not be late, incomplete, incomprehensible, unlawful, obscene, defamatory, libellous, threatening, pornographic, harassing, hateful, racially or ethnically offensive, capable of encouraging conduct that would be considered a criminal offence, capable of violating any law and/or capable of giving rise to civil liability. 5. The copyright of all entries remains that of the entrant at all times but may be reproduced by the Promoter for the express purpose of public relation and publicity of the results of the Competition and for the purposes of conducting the Promotion. The Promoter will endeavour to credit the entrant at all times if his/her entry is used and will seek permission for said use whenever possible. Separate negotiations shall be entered into should the Promoter or its agents wish to use any entries for commercial purposes. 6. By entering the Competition, each entrant warrants to the Promoter that the entry (including but not limited to the photograph provided) and any other work subsequently submitted is an original artistic work of the entrant, has not been wholly or partially copied from any other design or artistic work, and does not infringe the intellectual property rights of any third party. The entrant agrees to indemnify the Promoter against all claims and costs by third parties arising from a breach of the warranty set out in this condition. 7. Promoter accepts no responsibility for any incorrect or inaccurate information and assumes no liability for any error, omission, interruption, deletion, defect, delay in operation or transmission, line failure, theft or destruction or unauthorised access to entries and/or the entries being lost or deleted whether or not arising during operation or transmission as the result of server functions, virus, bugs or other causes outside its control (to the fullest extent permitted by law). 8. Promoter is not liable for any costs, claims, damages or loss suffered by any person as a result of entering this Competition occasioned by any failure, however caused, in the fulfilment of the terms of this Competition, except that no term of this Competition will operate to limit the liability of any party for death or personal injury caused by negligence. 9. The winner is advised that tax implications may arise from them winning the Prize and they should seek independent financial advice prior to their acceptance of the Prize. 10. Any questions, comments or complaints in relation to the Competition should be directed to the Promoter. These Terms and Conditions will be governed by and construed in accordance with the law of Victoria and any dispute arising out of or in connection with these Terms and Conditions shall be subject to the exclusive jurisdiction of the courts of Victoria. 1. Entrants’ personal information will be collected by Promoter to enable it to conduct the Competition and publicise the winner. Entrants’ personal information may be disclosed to marketing and communications agencies, prize suppliers and prize deliverers in order to conduct this Competition and fulfil the Prize. Entrants may direct any request to access their personal information to the Promoter. Entry into all Mornington Peninsula News Group competitions published in print, online or social media is free. Social Media competitions – entries must be submitted by Like and commenting on competition posts by the published closing date. Entry is open to all readers excluding employees of the promoter, publisher and associated parties. Competition entry opening and closing dates as outlined in each specific printed/posted competition. Winners for print competitions will be notified by phone, mail or email, Online competitions by email and Social Media competitions by private messaging on Facebook and noted on post. The prize must be collected from the Promotors Mornington Office, unless otherwise advised.